When they say that you can’t go home again, the proverbial They are usually talking about the fact that people change. Maybe you’ve changed; maybe it’s others. The landscape changes too: buildings get smaller, vistas are altered, developments go up or abandoned shopping malls fall down. But in listing the dangers of creeping nostalgia, to the best of my knowledge no one has ever mentioned what happens when the birds change. This year has brought a lot of new birds at the Olde Homestead. It started in mid-March, when my brother Brian reported that he’d heard a flock of Tundra Swans going over in the night.I was a bit surprised, but not terribly. Though I’d never spotted them, the range map for Tundra Swans does show them as passage migrants right smack dab over the Homestead, and we’re near their wintering grounds, so March seemed right. And after all, migration means anything can be anywhere. Well, probably not Great Auks, for a variety of reasons. But most anything. Most anywhere. I chalked up similar sentiments in April when my mother emailed to tell me that there was a Ring-necked Duck on the pond. I think of it as the “new” pond but it has been there since about a year after the barn burned down, and that’s getting on a decade now. Neither Mom nor Dad nor my brother Brian had ever seen one on the property before. 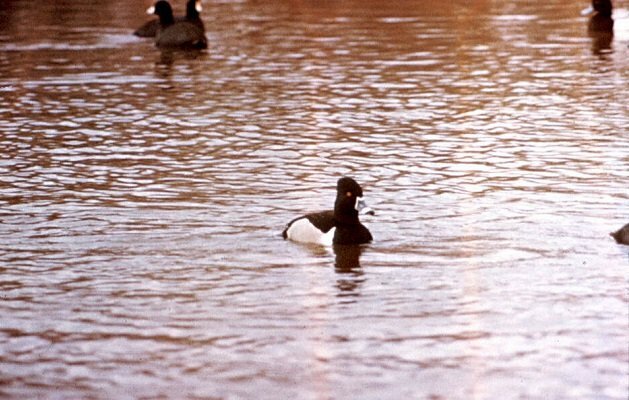 I’d never seen a Ring-necked Duck at the Homestead either, but I’d seen them on other small ponds in migration. It made sense. 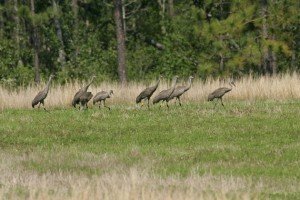 Then, the following week, a flock of Sandhill Cranes went over – a bird that’s expanded significantly in Western New York since I was a kid, so again, I tried to tell myself it wasn’t much of a surprise. The Orchard Orioles, though… I don’t know. Somehow, that got to me. I’ve only seen Orchard Orioles in the parks of New York City, and that is right and proper. It used to be uncommon in New York outside the lower Hudson Valley (at least according to a 1916 nature education leaflet that Google helpfully digitized.) On the other hand, Orchard Oriole is not a reportable bird in the eyes of NYSARC, anywhere in the state – and that distinction was only earned by the Sandhill Crane in 2000. I think what really stung was the fact that these orioles – and there were several, male and female, along with at least two pairs of Baltimore Orioles – were coming to the feeders. Mom and Dad had tried putting out grape jelly in previous years, with no luck, and I had consoled myself with the thought that orioles are just anti-social. But now, offered whole grapes instead, they are all over the place. This isn’t the home I once knew. It is far more orange and song-filled, a mysterious jungle-like place that I will have to navigate anew in summers going forward. Or maybe I’m just mad because Orchard Oriole isn’t on my year list yet. That could also be it. The specific reason Great Auks haven’t been reported from the Olde Homestead yet is the fact that they hide so effectively in groups of Labrador Ducks (the carrier species for overland rides of these flightless birds).